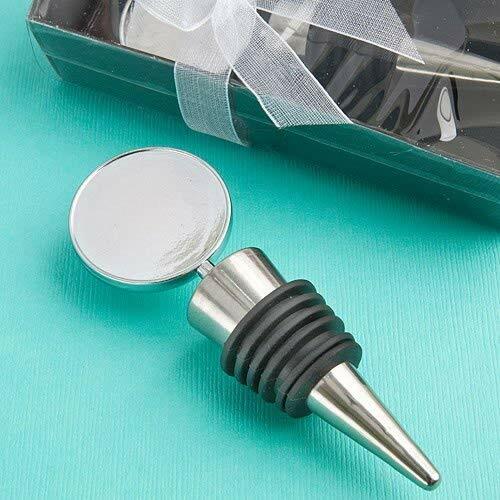 LOT of 96 DIY Perfectly Plain Collection wine stoppers for application of your DIY glass or resin art Description and details: Each Perfectly Plain Collection wine stopper measures 3.75 x 1" Made of silver metal with a black-rubber-gasket-wrapped conical base. The round metal disk top with an inset center is a perfect fit for easy application of your DIY glass or resin art . Each comes packaged in a clear topped box with a black base, finished with an attractive white organza bow. If you have any questions about this product by All Bottled Up, contact us by completing and submitting the form below. If you are looking for a specif part number, please include it with your message.